Malcolm X's Grandson Reportedly Killed In Mexico : The Two-Way Malcolm Shabazz, the grandson of slain civil rights leader Malcolm X, reportedly died Thursday, according to a friend of the Shabazz family. The circumstances of his death are uncertain. He was 28. 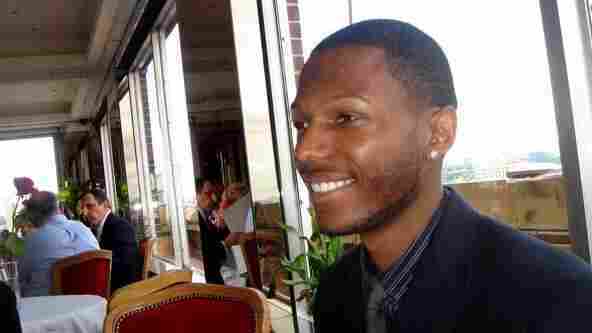 Malcolm Shabazz, pictured in this 2006 photo posted on his blog, is said to have died Thursday at age 28. Malcolm Shabazz, the grandson of slain civil rights leader Malcolm X, has reportedly died at age 28. A family friend says Shabazz was killed Thursday in Mexico. The news first appeared in New York's The Amsterdam News, after family friend Terrie Williams tweeted, "I'm confirming, per the U.S. Embassy, on behalf of the family, the tragic death of Malcolm Shabazz, grandson of Malcolm X." The circumstances of Shabazz's death remain uncertain. Several reports have linked his death to an attempt to rob him, but details about how he died have been varied. It is believed that he was in Mexico City. Williams, who runs a public relations firm, tells The Journal News that she had known Shabazz for years. Shabazz was 12 years old in 1997 when he pleaded guilty to the juvenile equivalent of second-degree manslaughter and second-degree arson after starting a fire in Yonkers, N.Y., that killed his grandmother, Betty Shabazz, Malcolm X's widow. After his release, Shabazz had more brushes with the law, as he was linked to a robbery and the destruction of property. On his blog, Shabazz wrote that in recent years he had been the target of "harassment from the police/Federal Bureau of Investigation"
The blog says of Shabazz that "since his release from prison a few years ago he has been traveling throughout the U.S. and around the world speaking to different audiences about the struggles that confront this generation." The News One site reports Shabazz had recently said his Facebook account had been hacked. And a posting on the social media site Tuesday said that "I have some very powerful enemies." Shabazz was reportedly in Mexico as part of his work with RUMEC, a labor and construction group in California. One of the group's leaders, Miguel Suarez, was deported to Mexico in April. "He's a supporter of our organization," RUMEC's Juan Ruiz says of Shabazz in an interview with Talking Points Memo. "He went to Mexico to meet with Miguel." Ruiz says that while he hadn't been in Mexico for the meeting, he had spoken to Suarez, who he says was present when Shabazz was attacked. "He was murdered," Ruiz tells TPM. "He was in Mexico City and I believe they attempted to rob him and he didn't allow it, so they beat him to death and he died on his way to the hospital."